Corgi-san, the old Japanese dog spirit was often mistaken for a fox because of her red coat and fox-like markings. Corgi-san, who loved good food and especially eggs, liked to sneak into a particular inn outside the city of Edo. The inn sat on a main highway, so many travelers stopped in to refresh themselves on their long journeys into the capital. For Corgi-san, this meant many new opportunities to steal food each night. On most nights, she waited until the patrons were well and intoxicated, and then she would tip-toe in and use her long tongue to steal fried eggs off the top of all the patrons' dishes until she'd eaten her fill. Her antics were well known among the inn's proprietors, but no one had ever been able to catch her. One night, a samurai of some skill and renown who lived nearby came to the inn, as he was fond of the egg-topped soba noodles. Corgi-san had seen the samurai before and thought it would be a good challenge and good fun to steal food from him. When he'd turned to talk to a particularly pretty waitress, she shot out her long, pink tongue, wrapped it around the samurai's egg and swallowed it whole. She thought she had gotten away with it and was ready to sneak back out, satisfied with the night, but the samurai drew his katana and pointed it right at her corner hiding place. "I see you, Corgi-san, and your thievery is well known in this inn! It's time you paid for all the eggs you've stolen from innocent travelers", the samurai declared. A wicked grin spread across Corgi-san's face. Although she was accustomed to an easy life, she was a dog spirit, and rising to a challenge was in her nature. "Only if you can catch me, Samurai-san!" she barked. With that Corgi-san leapt from the corner, farther than anyone would have guessed possible with her short legs. The samurai gave chase, and the inn's patrons cheered him on. He deftly untied his horse outside the inn and hurried after the quickly retreating dog spirit. The samurai's horse was strong and quick, and he caught up to the little dog spirit without problem. Looking back, she saw the samurai, now on her heels, draw his bow. She yelped and redoubled her efforts, feeling like she was in real trouble this time, but her best was not good enough. The samurai aimed his shot and let his arrow fly. It hit Corgi-san's back right leg, and she rolled off the road and into the brush. For a few moments, the samurai lost sight of her. When she emerged from the brush, she moved even faster than before. The samurai was surprised to see her carrying the arrow in her mouth; she seemed completely unharmed. He urged his horse on, and soon realized the dog spirit was headed straight for his house! As she approached the house, the samurai was even more surprised to see the arrow's feathers burst into flames. He realized what the corgi was doing, but he couldn't get his horse to run fast enough to catch up with her; she must have been moving with the aid of some magic. 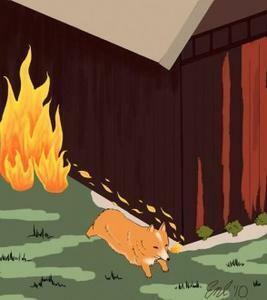 Corgi-san reached the house a good while before the samurai. She ran around it in a circle, letting the flaming arrow touch the wood, setting it ablaze. The samurai reached the house and stopped, his mouth agape. Once the dog spirit had done a full circle around the house, she disappeared back into the brush. As she disappeared, the samurai heard her say, "Your punishment didn't match my crime. I only wanted something good to eat! Maybe you'll think twice the next time you decide to exact your own judgment". Luckily for the samurai, his family was in the capital, because his house burned to ash. From that day on, he did think before he decided to pass judgment, and often erred on the side of mercy. Whenever he passed a shrine to the local gods, he always left a delicious treat in honor of Corgi-san.